Improving The Harley Davidson Superbike !! Tecleo aquí para la versión Española ! Just like Harley-Davidson, I was born in Milwaukee, Wisconsin. That's not enough for me to cheer for them, though. It has a lot more to do with my wanting to see the "underdog" pull out a victory !!! Harley - Davidson Will Win. One of the problems with dyno testing is that it fails to take into account what actually happens on the racetrack. This kind of thinking usually makes power & speed seem mysterious. Can anyone see an even bigger problem ?? Well, it's been almost a year, and no one's guessed it. As you scroll down I'll explain the problem and reveal the answer. See if you can figure out what it is. Think Outside of The Box !! 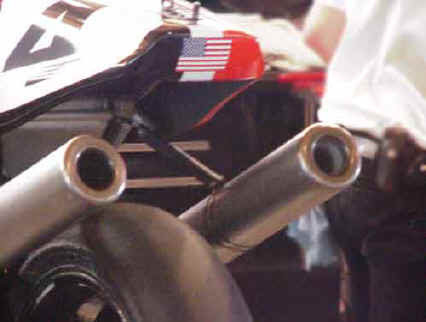 These are the pipes from Miguel Duhamel's Brainerd race winning Honda RC51. It's a V Twin engine, and like the Harley, it has an individual pipe for each cylinder. Notice the color of the exhaust residue in both pipes is the same. That means the Fuel / Air ratio is equal in both cylinders. The color difference means that one cylinder is possibly correct, but they can't both be right. Either the Fuel / Air mixture is wrong, or the left pipe's cylinder is burning a lot of oil. I didn't notice the Harley smoking on the track, so it's probably the Fuel / Air ratio. Aerodynamics have just as much to do with the front of the bike as the rear. 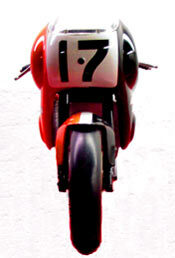 This toy model is from the original Harley VR1000 superbike. Although the 2000 VR1000 has 2 exhaust silencers, the problem is still the same. A plate in the wind. Of the 3 forms shown here this is the worst shape. This shape appears to work much better. Yet it's actually not much better than the plate !! The wind comes around the back of the bowl and creates a tremendous amount of turbulence. Rounding the front of the bodywork isn't the entire answer. This is the most aerodynamic form for a motorcycle. This drawing is not to exact scale, it's just to illustrate the point that adding a "tail" to the bowl shape makes a huge difference. The shape of the rear of a vehicle is critical to it's aerodynamic success !! the most significant part of the aerodynamic form !! 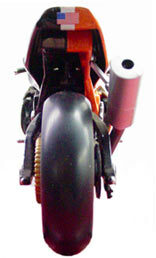 This side view of the original HD superbike will help to illustrate the problem. Enter The Secret Mototune USA Wind Tunnel !! The air is flowing over the bodywork and rider in approximately the same ideal "raindrop" shape. The tail section and the rider help to form the cone. Unfortunately, this doesn't even come close to simulating what happens on the racetrack. Because the bike isn't running !!! Let's Turn Off The "Wind" & Fire Up The Bike !! 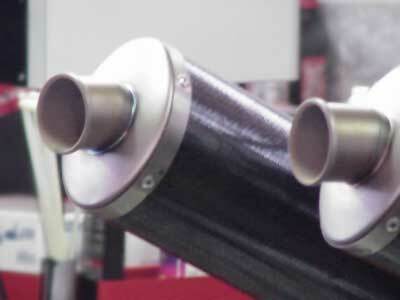 The huge 500cc pulses of exhaust gasses are putting a new force into the aerodynamic equation. So the cone can't form properly. Notice that it "tries" to form, but now it's much further back. The aerodynamics are disrupted by the direction of the exhaust gasses. That's one reason the Harleys aren't as fast. The bike is fighting itself. PLUS: The wake it produces is larger and further back than most bikes. That gives the bikes behind it a huge advantage !! ...the easier it is for Honda, Ducati, Suzuki, Yamaha, and Kawasaki riders to draft past. The downslope of the tailsection is correct. The upslope of the exhaust gasses cancel out the ideal teardrop aerodynamic form. Without the directional outlets of the competition's exhaust design, the gasses exit upwards, rather than backwards. Now it's easy to understand why the Harley VR1000 should use this pipe design. The silencers' outlets are simply pointing in the direction of the bike's aerodynamic wake. If you're interested in truly understanding the way power & speed are achieved, I recommend signing up for my tuning newsletter. that you won't read anywhere else. 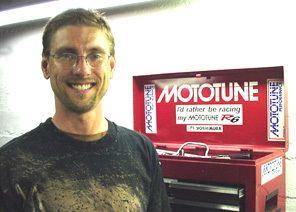 Free Mototune Performance E-Newsletter ! !